Enjoy the great outdoors in comfort with this International Caravan rocking chair. Place this chair in your sunroom or out on the front porch, deck or patio for restful rocking as you read, watch the sunset or chat with friends. 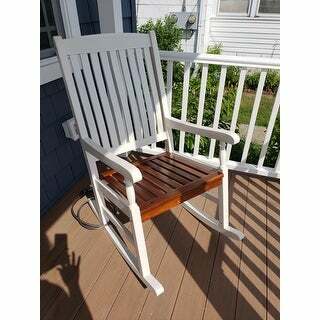 The UV-protection paint keeps this relaxing acacia hardwood rocker sturdy enough to withstand years of use. Choose the right color that complements your home's exterior for a satisfying look. Dimensions 4.0 In. X 27.0 In. X 46.0 In. I love this rocker. I got the red one. I expected a primary red, but the actual red was more "adult" and subtle, which I like much more. Put it together in less than an hour. It was packaged well, and there was no damage to the chair during shipping. I'm 290 lbs and the chair does not even creak when I sit down; in addition, it's very roomy. I have it out on the deck and I cover it with an outdoor cover when not in use to protect it from the weather. I did, however, place a rug underneath it since my deck is textured concrete (to prevent the paint from chipping). Everyone wants to sit in MY chair. I am going to have to buy an extra. I bought 2 of these chairs. I was a little hesitant after reading several of the other reviews because of the concerns about putting these together. Well, they were right. There are only a few pieces, but getting everything to line up was difficult. On one of the chairs we had to use a drill to get the bolts to line up properly. It took about 2.5 hours to put together 2 chairs. The quality is good, chairs are heavy duty, quite big, and surprisingly comfortable. I purchased the white ones, but beware, if you are looking for white, these are more of a cream/yellowy color and are not white. They still look great though and I am very happy once again with my Overtock purchase! 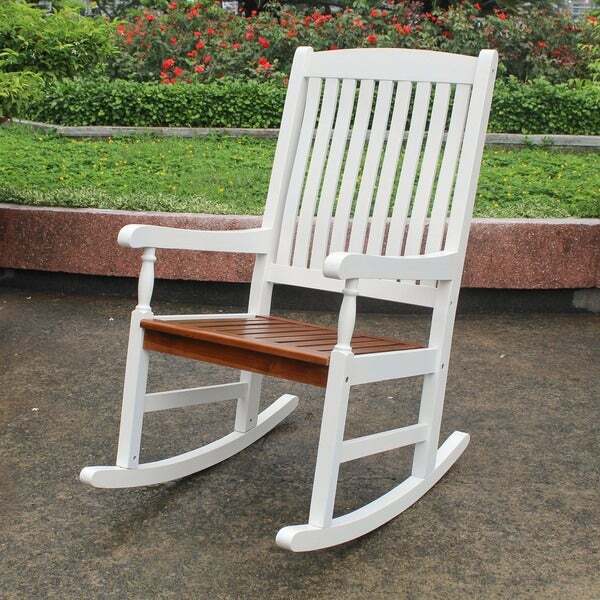 Bought two rocking chairs in the white color. Good thing we like cream colored chairs on our deck. 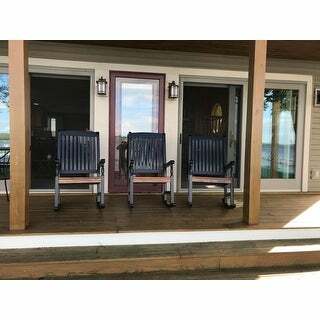 We've purchased these rockers before and they are roomy and very solid construction. Prior chairs were difficult to assemble but these rockers were easy and the pre-drilled holes lined up this time. They look great on our deck and the only real negative is that they arrived very poorly packaged so some of the paint was chipped off which I will have to repair. The good: These are beautiful, stately and comfortable. We were impressed with the heaviness and smoothness of the wood. They are more than ample, roomy, in fact. We bought 4 in black and natural varnish for the porch and they transformed the area into one that is so inviting. While I bought separate 20"x20" cushions for the seats, these rockers are quite comfortable without them. The not-so-good: They took a very long time to assemble because the pre-drilled holes did not match each other. Lining them up simply became only a guide, as usually a hole needed to be slightly deeper in order for a cross-pin to screw through an anchor pin to sturdily hold the rocker legs to the uprights. This drove my husband nuts on the first one until he figured it out. The other not-s0-good is that I wish they had a little more backward swing when rocking. It seems the backwards rocking motion should go a little longer. But then again, they would need longer legs in the back, and that would mean we would need a deeper porch. We bought two rocking chairs for our log home covered porch. The chairs are sturdy and gorgeous and blend beautifully with the style of our home. The first chair took less than an hour to assemble - a couple of the alignment holes were off but we used a drill to correct them. The second chair we put together in about 20 minutes - same issue though with alignment but we were prepared for it and had the drill handy. We bought the black chair with the cedar colored seat. Couldn't be happier with the results. These chairs were extremely difficult to put together. Not necessarily the directions, although I did have to really study them, but the hardware was very hard to work with (lining things up and having the nuts fit the bolts, etc.). After assembling the entire 1st chair (I bought 2) I lifted the rocker off it's side and the spindle under the front part of the arm cracked. I repaired with clear liquid nails but it's definitely a weak point so we're very careful with them. Also the red paint comes off on our wood deck when the chairs are moved by dragging, so only lift them to move them if you want to save the floors. The chairs look great but aren't the most comfortable. We added lumbar pillows and they are better now. Good value, but really had to work to get them where we enjoy them. K.D. Rocking Chair are all we thought they would be. Love the size and color,very durable. a perfect look to our front pourch. Would rocommend to friend and family. 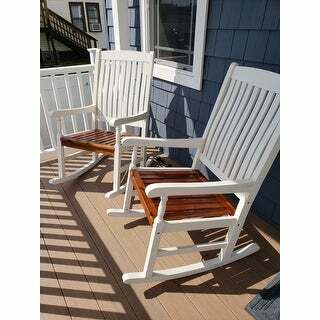 these look great and a great price for this rocker...easy to put together. This rocker is quite comfy and i'm really glad that i purchased. we bought two and just love sitting on the back porch enjoying our new chairs. great price too! I ordered two of these chairs for my mother-in-law while I was deployed to Iraq. I was so happy to see the pictures of them sitting on her porch just as beautiful as the pictures posted on Overstock. My father-in-law put them together with ease...no more than an hour each. They are very sturdy and will hold up for years to come! I couldn't be more happy with my purchase...and my in-laws feel the same! Thank you! Excellent purchase, excellent product. Packaged for easy assembly. Clear instructions, I was able to assemble the product in under an hour. Don't be afraid of the "barrel nuts" - just slip them in the pre-drilled holes, line 'em up and thread the bolt! The assembled chair is sturdy and attractive. My daughter loves this rocker! Very well made and Very Large. It takes a little while to assemble and you.... need two people. This rocker will last forever. Have had this chair for over a year! Love it! For wood chair, it is comfortable even without a chair pad! Matches other items that I have in the room. REALLY like it! We bought 2 rockers. After almost done with the assembly, we noticed the rocking bars on the bottom wete cracked. They were cracked on both rockers. So we had to disassemble and repackage to send them back. Overstock did send UPS to pick them up. 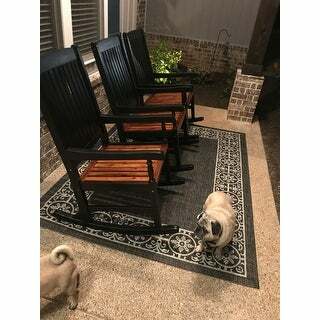 We bought different rockers from a different internet company afterwards. Nice chair. A little hard to put together since the holes didn't line up properly, but I made it work. I would recommend checking all the holes before you start in case you have move them. It’s very big. Spiders flock to it. We keep it on porch because it’s not meant for inside use. We bought the black and like it very much. Great for rocking grandchildren if you have long legs! Love the rockers. They look very nice when put together and fit our place perfectly. Beautiful sturdy chairs. Took a while to get first chair together as some of holes are not so easy...but once my hubby and I did the first one, we got the other 2 were much easier. So pleased! Outstanding rockers. Unfortunately, one of the chairs was damaged upon delivery. Overstock's customer service was outstanding and took care of getting a new chair without issue. I would highly recommend this rocking chair. Once the chair is together it is 5 stars, The challenge is constructing the chair itself. These are not simple to construct. I ordered 4 chairs, the first had incomplete instructions, thankfully the second had a complete set so used those. Chair two was missing screws, but those were a common size so no big deal. Chair three had complete instructions and all parts However the process of lining up the dowels to the corresponding holes was almost impossible. Can't report on chair four since I quit after three, UPDATE - chair four went together in about 10 minutes. "What is the measurement of the front of the seat from arm rest to arm rest (width of the seat)? Does the seat bottom narrow at the back?" "How high is the seat from the ground?" The seat height is approximately 18 inches. "Does this product come fully assembled? We have small doorways and need a chair that is only semi-assembled. Please let me know which parts come together already. Thank you"
Hello bmayfield, will the Large Grandmother Rocker Item #: 10876087 work for you? Assembly required. Please feel free to contact us again with any further questions. Thank you for shopping with us! "What company makes this rocking chair?" Unfortunately we do not have that information available to us. We apologize for any inconvenience. "Does this rocker come assembled?" No, some assembly is required.